The Packers' playoff hopes received a boost with the news that Aaron Rodgers will start against the Bears. The Great Clavicle Drama is over. After weeks of speculation, X-rays have revealed Aaron Rodgers’ shoulder is well and Chicago’s playoff hopes are not. 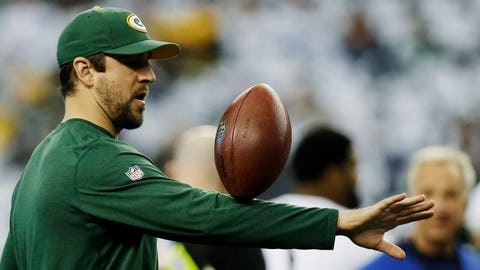 “Aaron is ready to play,” Mike McCarthy announced Thursday. It had a momentous ring to it, sort of like Gen. MacArthur returning to the Philippines. If Manila had a team, however, it probably would have already clinched the war-torn NFC North. The Bears could have done it last week but were ripped, 54-11, by Philadelphia. The Lions should have done it a month ago but pulled their traditional retreat. And now, despite Rodgers being out two months and a defense that’s been missing all year, the 7-7-1 Packers are in a dream spot. Beat the 8-7 Bears Sunday in FOX’s Game of the Week, and they will take the division. “We are truly blessed,” receiver James Jones said. And that was before he knew Rodgers would be quarterback. McCarthy didn’t tell the team until 8:05 a.m. Thursday, even though the decision was made Tuesday. Perhaps he wanted every Christmas dinner in Wisconsin to be dominated by clavicle talk. It’s been all the rage since Rodgers broke his left collarbone against the Bears on Nov. 4. He was having a typical Rodgers year, 15 touchdown passes and four interceptions. Green Bay was 5-2, and almost all seemed right with the Packers’ world. Then came Seneca Wallace, Scott Tolzien, Matt Flynn and a 2-5-1 record. Flynn actually did enough simply by helping Green Bay beat Atlanta, 22-21, and Dallas, 37-36. That kept Green Bay in the NFC North turtle race and magnified the anxiety over Rodgers’ return. Were the doctors being too conservative? Aren’t broken bones supposed to heal in six weeks? Had Rodgers gone soft? The Packers’ lips were sealed. Was the football staff clashing with the medical staff? Where was Edward Snowden when we needed him? Depending on the day and the unnamed source, Rodgers was done for the year, returning the next game or just stuck trying to log into Healthcare.gov. It wore on everybody, especially Mr. Clavicle himself. Whether it has yet is still a mystery. If a bone is 80 percent healed, that’s enough for some teams to clear a player. Clavicles can be dicey, however, because the blood flow is poor and healing take 12 weeks. More like the nick of time. Green Bay can win with a bad defense. It went 15-1 in 2011 and had the worst defense in the league. What it can’t do is win without Rodgers. He doesn’t play defense, but he keeps opposing offenses on the bench. The Packers were averaging about eight minutes more possession time per game when Rodgers was healthy. That reversed after he was injured. The Bears set up as the perfect fall guys. They can score but can’t stop anybody. And after the Philadelphia debacle, even the offense is suspect. Jay Cutler hasn’t looked good since returning from an ankle sprain two games ago. The QB debate in Green Bay is benign compared to Chicago. The Cutler era might end Sunday since he’s an unrestricted free agent. That would suit a lot of Bears just fine, especially if Chicago finishes the year 0-2 and the hated Packers take the division despite all their problems. Now the season is riding on his shoulders. Even if one is hurting, you can see why the Packers feel blessed.